Lawyer-theologian Edward William Fudge is one of the Christian writers I greatly admire not only for his wisdom-packed writing but also for his humility and his genuine love for people. Although associated with the (Stone-Campbell) Church of Christ, he has steered clear of the sectarian bent of many in his denomination and has served Christians in other church groups. His website, EdwardFudge.com, is a rich resource for Christians seeking answers to various religious issues. 1. The Great Rescue: The Story of God’s Amazing Grace. Orange, CA: New Leaf Books, 2002. 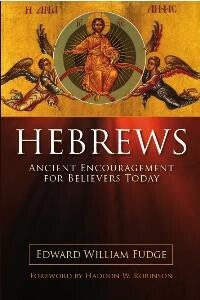 Consisting of 18 short chapters of simple yet powerful prose, it retells the Biblical narrative from Genesis to Revelation. My favorite section of the book is chapters 13-16 where he lucidly expounds on grace and faith and on how these work in the life of the church. 3. Two Views of Hell: A Biblical and Theological Dialogue. Downers Grove, IL:InterVarsity Press, 2000. With Covenant Theological Seminary professor Robert A. Peterson as co-author, Edward passionately advances the “Conditionalist” view as against Peterson’s “Traditionalist” position on a hot issue in the Evangelical world — the nature of eternal punishment– arguing, among others, that the doctrine of the soul as essentially immortal is a product of Greek philosophy and not of proper Biblical exegesis and that the biblical doctrine of “eternal punishment” does not actually mean “eternal torture” but a divine judgment which is of limited duration commensurate to the degree of one’s wickedness and which ends with the wicked ceasing to exist (i.e., eternal separation). Some of his works can be downloaded for free from www.freedomsring.org.